Seth Meyers will learn how to stand on his mark. That’s both a metaphor and a literal (minor) critique of last night’s debut episode of Late Night With Seth Meyers. In his opening monologue, the longtime SNL head writer and “Weekend Update” anchor found himself sans desk and started to wander, walking awkwardly toward the camera. It’s not a disaster, and it didn’t ruin any of his jokes, but it is a reminder that Meyers might need a little time to get the hang of this. Jimmy Fallon moves around a bit during his monologue — way more than David Letterman does, for example — but Fallon’s delivery is peppy and a little scattered, too; Meyers’s first monologue was all down-the-middle one-liners, delivered in the exact “Weekend Update” cadence. An opening monologue doesn’t have to be pure, traditional stand-up, but it’s always going to be something close to that: Just a person staring right into the camera, telling us jokes with some illusion of casualness. Oh, did you hear about this today? The best moment of Meyers’s monologue came when one of the lines didn’t quite work, and Meyers said brightly, “all right! Our first sorta bomb!” We know he’s not winging it, he knows he’s not winging it, but it’s nice when a monologue (or any segment, really) has the feeling of being a host’s actual thoughts in his or her natural style. Meyers settled in more once he sat down at his desk. In last night’s highlight, he told a self-deprecating story about not knowing how to change a tire. The story was darling and certainly funny enough, but the real strength was that it was his, and it didn’t sound like any of the other late-night hosts. 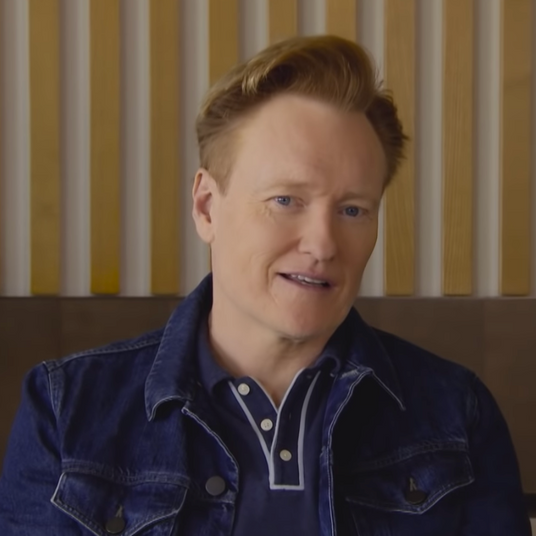 Conan O’Brien is certainly comfortable making fun of himself, but Meyers has a bright kind of sarcasm where O’Brien has more of a goofy persona when talking about himself. The other desk segment — a series of Venn diagram jokes — fell flat in comparison, in part because the jokes themselves were just okay (Nicki Minaj and Hoarders overlap with “junk in the trunk”? Timely! ), and also because there’s nothing particularly Seth Meyers–y about it. And that’s completely normal for a first show. That’ll probably be true for the next six months or the next year. But where Fallon had years in between leaving the “Update” desk and getting behind the Late Night one, Meyers had only a couple of weeks — which is why it’s surprising to see him struggle to find his voice. It’s a familiar voice, one we last heard not too long ago! I’m not looking for a rehash of “Really,” but that kind of hyperincredulity probably should make it to Late Night somehow. There were hints of Meyers-as-straight-man in his bantering segments with Fred Armisen, but either Armisen needs to be weirder or Meyers needs to play along less if the chitchat is going to be actually funny rather than just humorous. If the monologue doesn’t feel more conversational in a few weeks, why not go Jon Stewart–style and stay at the desk the whole time? Aesthetically, Meyers’s blue-grid monologue background looks like the Jeopardy set. The stairs up to his desk should probably wrap all the way around the set, given that guests Amy Poehler and Joe Biden both initially missed where the step is; it is too far upstage. The desk and guest chairs seem a little wan, but maybe that’s how new sets always seem. And maybe as Meyers himself settles in, the studio too will feel more settled and less like a hotel conference room. In closing out the show last night, Meyers joked to his (way too active) studio audience that he wanted everyone to stick around so they could do “about five hours of notes.” That’s the class factotum side of Meyers I want to see more of during the actual show. David Letterman’s the curmudgeon. Chelsea Handler’s the raunchy one. Stephen Colbert’s the satirist. 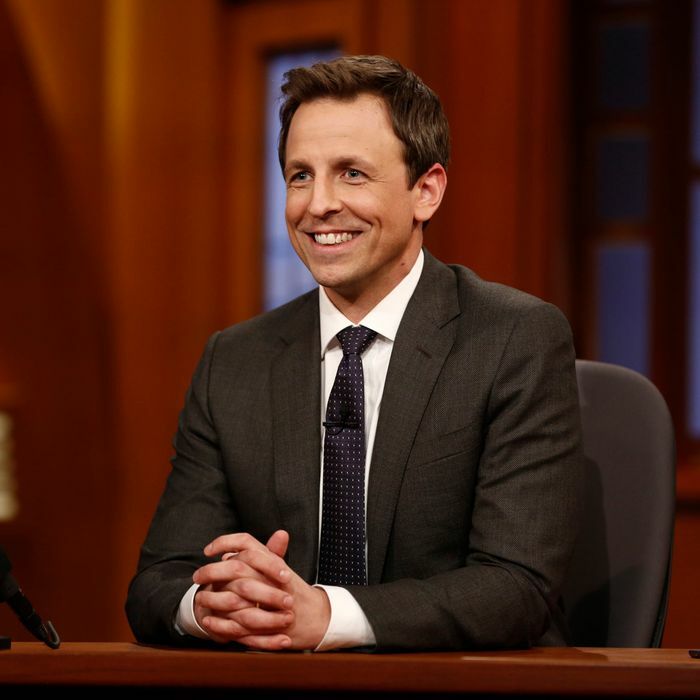 The mission in the next year or so for Late Night With Seth Meyers isn’t just to be funny. It’s to figure out which one Seth Meyers is.